Chronic stress is a huge problem that has only gotten worse in recent years. The good news is that new research is emerging to help treat stress in more effective ways than ever before. Mind-body bridging is one of these new modalities. Shown to be effective in both clinical and research settings, the easy-to-use mind-body bridging system helps readers dramatically reduce their stress in one to three weeks. Mind-Body Workbook for Stress helps readers learn and practice exercises for detaching from painful thoughts and feelings and helping their bodies relax and let go of unconscious tension. In this resting state, body and mind can let go of stress and heal naturally. Readers also learn fast-acting mindfulness skills for dissolving stress whenever desired without needing to maintain a long-term meditative practice. The one-page assessments, worksheets, and activities in this book make it easy for anyone to develop their capacity to withstand and relax under stress. "Mind-body bridging is a new body-mind language that allows people to reconnect with their ability to function effectively. Since I have directly witnessed the power and efficacy of Stan's work, I am very ready to state that the approach of mapping and bridging can be an adjunct to spiritual practice or it can stand on its own." --Charlotte Joko Beck, bestselling author of Everyday Zen "Transform your life in a matter of ten days. I did." --Christiane Northrup, MD, author of Women's Bodies, Women's Wisdom "Dr. Stanley H. Block helps people see their mind as never before by helping them recognize their identity system and then guiding them through simple mapping exercises to teach them how to bridge, which rests their I-System so that they can unblock their potential to deal with their career, health, or anything." --Shirley MacLaine, actress and author of Out on a Leash and The Camino "This mind-body medicine-based workbook guides readers back to their inner reservoir of self-empowerment by showing them how to override a learned stress response and faulty brain network and regain access to their natural executive functioning. 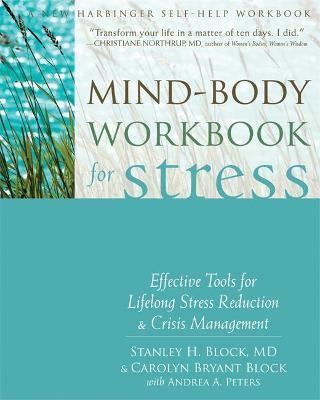 The mind-body mapping exercises outlined within teach readers how to reduce stress and develop a set of personalized, powerful, crisis-management tools. Moreover, since these exercises are quick and easy to do, they'll become a welcome staple of your lifelong health regimen. But don't be fooled by their simplicity. I've witnessed their powerful impact personally and in my work with cancer patients and their caregivers." --Michelle Rodoletz, PhD, assistant professor in the department of psychiatry, Fox Chase Cancer Center, Philadelphia, PA, and director of the Continuing Education Program for HealthForumOnline (www.healthforumonline.com) "Dr. Block's bridging methods have given me new ways to help pitchers deal with adversity and compete in the major leagues." Stanley H. Block, MD, is adjunct professor of psychiatry at the University of Utah School of Medicine, and a board-certified psychiatrist and psychoanalyst. He is a consultant on the medical staff at U.S. Army and Veterans Administration Hospitals. He lectures and consults with treatment centers worldwide and is coauthor of Mind-Body Workbook for PTSD and Come to Your Senses. He and his wife, Carolyn Bryant Block, live in Copalis Beach, WA.